Add essential oil, drop by drop, to a tablespoon of carrier oil. Essential oils are distilled from the leaves, bark, roots and other aromatic portions of a botanical. Essential oils evaporate and have a concentrated aroma. Carrier oils, on the other hand, are pressed from the fatty portions (seeds, nuts, kernels) and do not evaporate or impart their aroma as strongly as essential oils. Carrier oils can go rancid over time, but essential oils do not. Instead, essential oils "oxidize" and lose their therapeutic benefits, but they don't go rancid. The term carrier oil is generally limited to use within the practice of aromatherapy. In natural skin care, carrier oils are typically referred to as vegetable oils, fixed oils or base oils. Not all fixed oils/base oils are vegetable oils. Emu oil (from the emu bird) and fish (marine) oils are also classified as fixed/base oils, but these animal-based oils are generally not used for aromatherapy work. Some carrier oils are odorless, but generally speaking, most have a faintly sweet, nutty aroma. If you come across a carrier oil that has a strong, bitter aroma, the carrier oil may have gone rancid. See the Carrier Oils and Rancidity section of this article for information on rancidity. Trends are changing, but most typical vegetable oils sold in grocery stores are not cold-pressed. Instead, the oils are processed using heat. For the most nourishing, freshest carrier oils, strive to shop with retailers and suppliers that specialize in the sale of aromatherapy or natural skin care ingredients. Your local health food/nutrition store may be a source for carrier oils, but the oils can often be pricier. Watch for dust on the bottles when buying oils locally. That can indicate the oil has been sitting around for awhile. Look for oils that are not blends of two or more oils and that have no additives. Mineral oil and petrolium jelly are byproducts of petrolium production and are not used in aromatherapy. Mineral oil is used in baby oils and many commercially available moisturizers because it is an inexpensive oil to manufacture. It, however, can clog pores, prevent the skin from breathing naturally, prevent essential oil absorption, prevent toxins from leaving the body through the natural process of sweating, and I've read reports that it can be absorbed into the body and block vitamins from properly being utilized. These same concerns apply to petrolium jelly. For fragile carrier oils or for those that you will be keeping for a long duration, store them in dark glass bottles with tight fitting tops, and store them in a cool, dark location. Amber or cobalt Boston round bottles are ideal. If you will will be using up an oil well before its lifespan, it really doesn't need to be transfered to dark glass. When you purchase carrier oils, the supplier may have packaged it in a plastic (PET/HDPE) bottle. This doesn't mean that the oil is inferior. Often suppliers use plastic bottles to save packaging and shipping costs and because many customers use up the oils shortly after purchase. 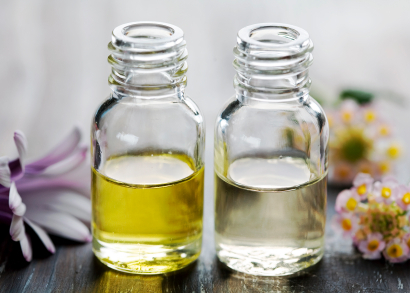 Unlike with essential oils which should always be stored in glass (essential oils can dissolve the plastic), carrier oils can be stored in plastic. Most carrier oils can be stored in the refrigerator, and this can help prolong the lifespan of fragile oils like Borage Seed Oil. Avocado Oil, however, should not be stored in the refrigerator. Oils stored in the refrigerator may solidify or turn cloudy and will need time to return to room temperature prior to use. Essential oils do not go rancid. Carrier oils, however, do become rancid over time. The level of natural fatty acids, tocopherols, method of extraction and other characteristics of an oil all can affect how quickly an oil becomes rancid. If you come across a carrier oil that has a strong, bitter aroma, the carrier oil may have gone rancid. If you can, compare the aroma of the oil that you suspect is rancid with the same botanical oil that you know is fresh. Carrier oils that you purchase should be natural and unadulterated. Exceptions include buying carrier oils that have natural Vitamin E added. Vitamin E, often listed as tocopherols acts as a natural preservative. Vegetable buttes are not carrier oils, but the beneficial properties of vegetable butters like Cocoa Butter and Shea Butter make them lipids that are suitable for use in aromatherapy. Vegetable butters are similar to vegetable oils but are solid at room temperature. Vegetable butters are processed by a wide variety of methods, so it's especially important to check the method of extraction when shopping for butters. Strive to use butters that are cold pressed. YOU CAN CERTAINLY ORDER ESSENTIAL OILS FROM THIS SITE. ALL YOU HAVE TO DO IS CLICK ON THE "YOUNG LIVING OILS' TAB TO THE RIGHT AND IT WILL TAKE YOU RIGHT TO MY OFFICIAL "YOUNG LIVING OILS" WEBSITE. YOUR ORDER WILL BE SHIPPED RIGHT TO YOUR DOOR.